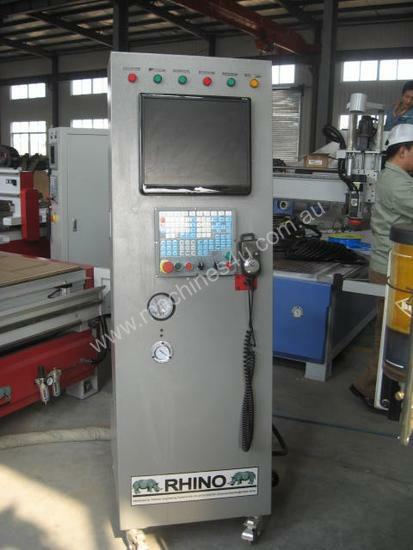 Machine base made from electro-welded heavy steel sections, strengthened in the most stressed areas. The top section of the base integrates the frame supporting the phenolic flat work table making the whole structure very robust. The beam supports the Y & Z carriages movement along the X Axis, & is made from an electro-welded thick steel structure braced for maximum rigidity. This gantry beam is supported on high precision lineal guides on both sides of the structure. All fabrications are heat treated after welding to relieve all stresses prior to machining. The X Axis movement is driven by Japanese Yaskawa drives through high precision German made helical rack & pinions and Neugart German Gear Boxes giving a variable feed speed upto 60mt/min. The Y & Z axis movement is driven by Yaskawa drives through a precision ground ball screw and preloaded nut to avoid backlashes and high precision. Pneumatic cylinders compensate for weight of the working unit, giving a perfect balance during vertical (Z Axis) movement. 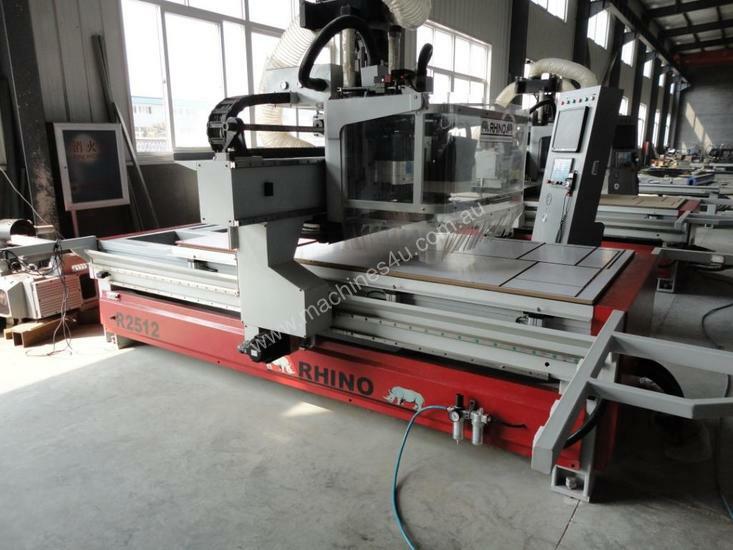 The work table is made from phenolic material and is precision machined, incorporating a vacuum clamping system. The table is divided into 3 equal fields along the X Axis, which are push button selected for zone 1 (1/3rd of working area), zone 2 (2/3rd working area) or all fields for the full working area – all operated remotely from the slimline console. There are (3) three pneumatic reference stops in the Y Axis, and in the X Axis there are (4) four pneumatic stops that control a full length fence; this full length fence with reference stops is located on either side of the X Axis. When positioning the panel (1) one fence activates with the Y Axis stops and when automatic unloading the panel with pusher at end of the cycle, both X Axis side fences rise up to guide the panel off the table. 1 x 250m3 Vacuum pump with flexible vacuum hose to a storage tank incorporated in the frame of the machine. A vacuum gauge is located on the slimline console to show the vacuum pressure. An automatic lubrication system by Bijur distribution manifolds and grease manual pump distribute lubricant to the X, Y and Z guide systems, leaving only 2-3 manual grease points required to be serviced monthly. 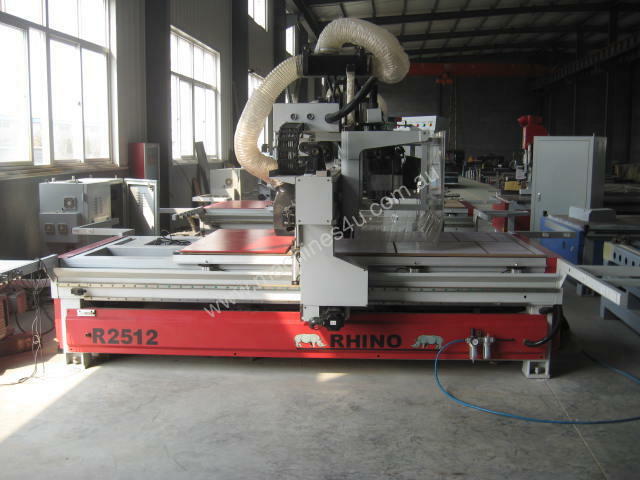 There are four (4) infrared protection barriers on brackets mounted off the X Axis side of machine to stop the machine, should an operator approach the working area while machine is running. There are two (2) infrared barriers on the Y Axis ends of the machine to isolate the machine should operator approach sides of machine while running. Emergency button located on the slimline console. 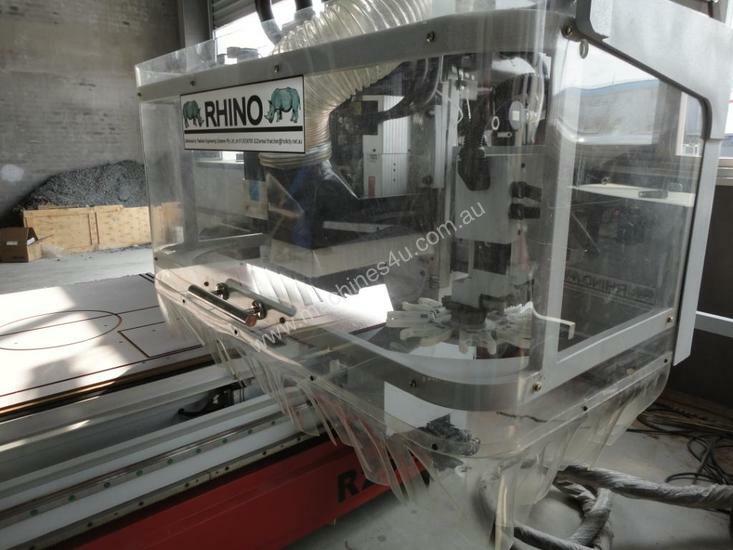 Safety hood a curved safety glass / plastic cover, hinged for access, is fitted to the machine for protection of the tool change, router & drill head. With filter, regulator and lubricator is located on the lateral side of the machine for connection to clients air system. An air pressure gauge is located on the slimline console, and built into the circuitry is a pneumatic safety switch to stop the machine should air pressure drop below minimum working level. 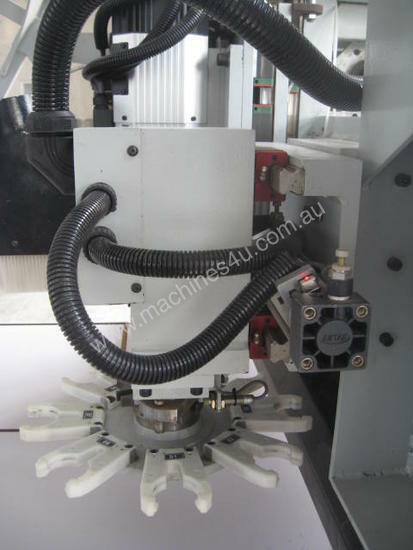 NC Controller pusher for the automatic removal of parts after machining onto a MDF table (provided by client) on the outfeed. This allows for the operator to manually load next board then go to outfeed side once the new cycle has started, to unload the nested pieces. When the pusher is pushing, there is also a dust collection head built into the pusher that vacuums the table to remove any dust, there is a two way valve in the dust collection hood that isolates the router dust collector when vacuuming and similarly isolates the dust collection hood when routing, to give full working pressure when dust collecting either system. 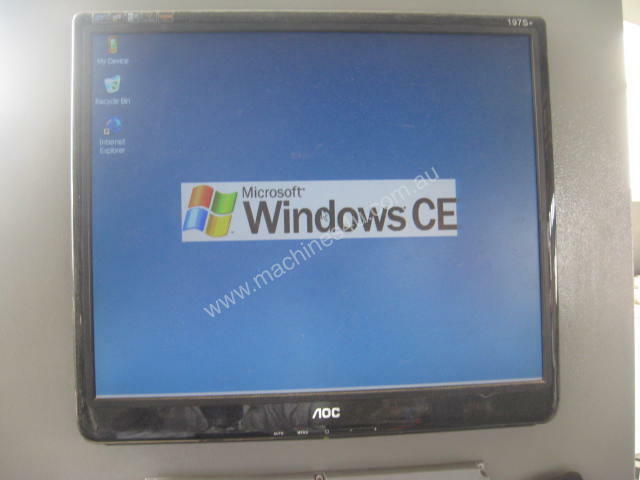 With full colour monitor and keyboard located in the slimline console, with main PC based controller located in the electrical cabinet. Cables are plug in type connections for easy installation. 1) 2 Bag Dust Extraction Systems with ducting. 2) 2T Scissor Lifter with height sensor for incoming packs.